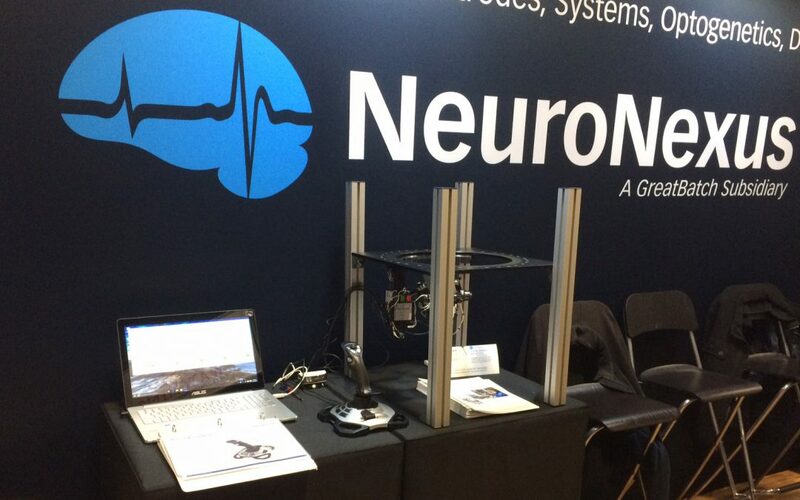 Victor, NY — November 13, 2017— Neurotechnology innovator NeuroNexus has added New Scale Technologies’ MPM Multi-Probe Micromanipulator System to its line of high-value neural interface technology, components, systems, and software. NeuroNexus will demonstrate the MPM System positioning three NeuroNexus A32 silicon neural probes at Neuroscience 2017, Nov. 11-15 in Washington, DC, at booth # 2234. NeuroNexus develops and sells high-quality microelectrode arrays for electrophysiology and optogenetics research, including acute in-vivo recording of neural activity in the brain. The MPM System is the only micromanipulator designed specifically for use with the new high-density silicon probes. It enables independent positioning and control of multiple neural probes in an extremely compact space, suitable for recording in small behaving animals. Each probe arm in the MPM System has four degrees of freedom for initial pre-adjustment, and three axes of motorized motion for precise x-y positioning and z-axis insertion. The motorized positioners automatically and independently move each probe to the optimum location in the brain. Up to five probe arms can be controlled from a single PC interface. The small footprint of the manipulators enables close spacing and ample clear space for virtual task environments, allowing neuroscientists to investigate multiple brain areas simultaneously as animals perform a variety of behaviors. NeuroNexus powers neuroscience research through innovative neural probes, systems, and data analytics software. NeuroNexus probes include a full line of high-quality, customizable microelectrode arrays for electrophysiology and optogenetics research. NeuroNexus systems provide integrated plug-and-play solutions to support diverse neurophysiology experiments and workflows. The NeuroNexus data analytics software platform provides powerful, scalable, cross-platform analytical and visualization tools for managing and analyzing neurophysiological data – from individual experiments to complex multi-investigator ‘big data’.